Tungsten carbide rod are mostly applied for drill bits, end mills, and reamers with sub-micron grain grade YG10X, for non-ferrous precision cutting and wood cutting with grade YG6X, and for fiberglass reinforced plastics, titanium alloys, hardened steel with ultra-fine grain grade YG8X, etc. 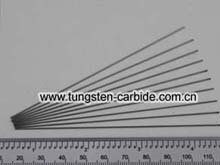 Tungsten carbide rods include rods with the shapes of round, rectangular and square, solid rods and rods with one or more straight or coolants. The grades are mostly fine and super fine grain with high performance. Purpose: Fine performance, suitable for processing of non-ferrous metal, plastic materials, carbon fiber, chilled cast iron and heat-resistant alloy steel, high-temperature alloy steel, stainless steel, high manganese steel, etc. Used in the manufacture of various metals and non-metal cutting tools such as drills, end mills, reamers. Also widely used in stamping tools and wear-resistant tools, etc. We supply premium grade tungsten carbide rod from stock in unground, centerless ground and polished form. 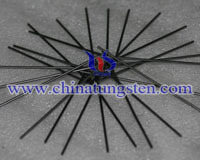 Tungsten carbide rod applications include drill bits, end mills, and reamers. Custom diameters and length are also available in these grades as well as metric sizes. We are ISO 9001 certified manufacturer of tungsten carbide rod for turning, milling, drilling, grooving and threading applications. We have over 10 years of experience manufacturing cemented tungsten carbide products. Our company's expertise in grade development, manufacturing, and application engineering assure customers the best choice for their unique requirements. Our advanced pressing and shaping systems give us the flexibility to offer numerous grades and sizes of tungsten carbide rods. Tungsten carbide rods are mostly applied for end mill and drill with sub-micron grain grade YG10X, for non-ferrous precision cutting and wood cutting with Sub-micron grain grade YG6X, and for fibreglass reinforced plastics, titanium alloys, hardened steel with Ultra-fine grain grade YG8X, ect. Tungsten Carbide Rods are manufactured as standards with one, two, or three holes, straight or twisted to a 30 or 40 degree helix, or solid with no holes. All rods are available in standard lengths of 310 and 330 mm. Custom lengths available by request.